South Korean officials have observed that North Korea is preparing for another ballistic missile launch. This past summer, North Korea has conducted multiple missile tests with reportedly more powerful and long-range ballistic missiles. Pyongyang claims to have created a mobile hydrogen bomb that’s capable of being mounted on a missile. The test was said to have caused tremors with a magnitude of around 6, which even spread to South Korea. However, officials have been unable to confirm the details of the bomb test, suspecting the hydrogen bomb may actually be an amplified non-nuclear bomb or smaller than North Korea claims. Nonetheless, this test blatantly disregards the travel bans and sanctions that were placed on North Korea earlier this summer by the U.N. Security Council. The U.N. security council is scrambling to take effective action to neutralize rising tensions amongst the feuding sister states. Furthermore, North Korea’s motivations are hard to discern. Is nuclear armament a threat to world peace or is it North Korea’s bargaining chip to international recognition? 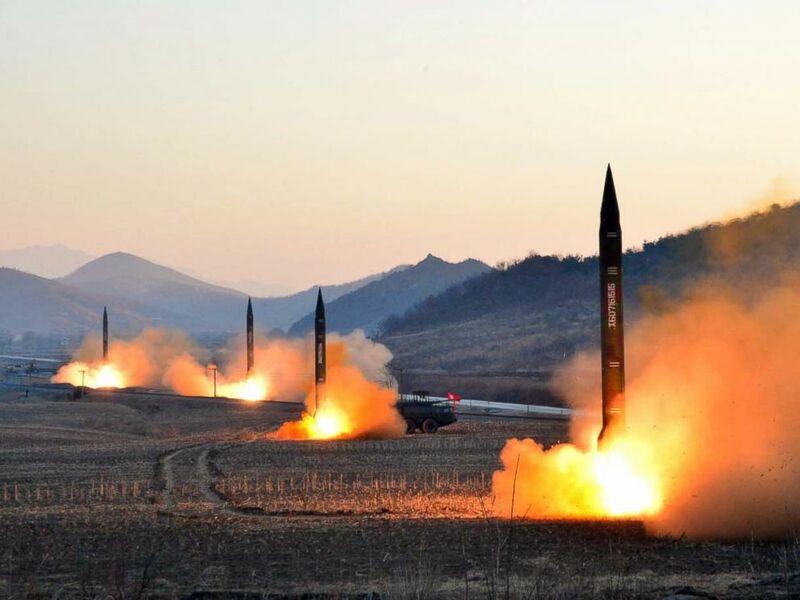 Relations between North Korea and her neighbours are becoming increasingly tense; with South Korea, Japan, China, and the United States all fear that they could be the target of a North Korean attack. Not only are Pyongyang’s foreign relations strained, but so are relations between Washington and Beijing. Rather than seeking cooperation, the Trump Administration has openly blamed China for engaging in trade with North Korea. China is the source for the vast majority of North Korea’s oil imports. Many hope that if China were to cut off oil supplies, North Korea would be forced into conversation or collapse. President Trump has also called out South Korea for seeking “appeasement” and has made it clear that the U.S. will not join the negotiating table. Furthermore, U.S. Defense Secretary, James Mattis, promised any threat would be met with “massive military response“, while U.S. Ambassador to the U.N., Nikki Haley, stated North Korea was “begging for war”. This is President Trump’s first big foreign policy test in the oval office. Considering the potential consequences of a nuclear missile launch, Trump’s actions and words must be carefully chosen. Instead, President Trump appears to prefer tweeting blank threats rather than coming together with U.S. allies to strategize against a potential nuclear threat. He has already driven a wedge with Seoul by refusing to come to the negotiating table with Pyongyang – provided they’re persuaded to talk. South Korea has the most to fear from a mobilized North Korean military and Donald Trump’s diplomatic withdrawal shows a blatant disregard for the United States’s long held and important allies. This does not bode well for resolving a potential nuclear threat from North Korea. So far, Trump has threatened to stop trade with all countries that trade with North Korea. This long list includes China, the United States’ largest trading partner. This would result in catastrophic economic consequences for both countries and would likely hurt the U.S. at least as much as it would hurt China. Furthermore, the economic sanctions that the U.S. wants China to implement against North Korea would likely hurt citizens would more than the government. However, sanctions are typically most harmful to the people within a country, and North Korea, as many dictatorships have, has shown it is more than willing to risk the welfare of its people in exchange for furthering the government’s interest. Regardless, much of the pressure lies with South Korea, Japan, and China, but these countries have their own complex situations to sort out beyond dealing with a newly developed nuclear neighbour. South Korea has recently elected liberal President Moon Jae-in in May of 2017. The liberal party has typically favoured appeasement with North Korea. President Moon has advocated for talks and negotiation, hoping to rewrite a peace agreement. At the same time, South Korea, working with the U.S, launched a missile on September 4th as a reactionary display of power. The increase of U.S. presence in the region, including the THAAD missile defense system, has made China increasingly tense. Increasing military escalations make it harder to work towards peace or less dangerous diplomatic tools. China is in the unique position of being North Korea’s largest trading partner. North Korea heavily relies on its relationship with China for trade and protection, but China is under increasing pressure from it neighbours to stand up to the North Korean threat. Furthermore, China has abysmal relations with many of her neighbours, with never-ending border disputes with Bhutan, Japan and the Philippines. China’s unique position gives it greater bargaining power, as well as assurance that it is unlikely to be the one under nuclear threat. It has also brought greater international pressure to wield its economic influence. In fact, China may do exactly as the U.N. Security Council wants: agreeing that “greater measures” must be taken. However, China has much to fear: increased U.S. presence in the region, potentially in the form of a united Korea, a refugee crisis from a collapsed state, or a new nuclear power for a neighbour. Japan, in particular, has much to fear from a nuclear power in the region. Notably, Japan is only now remilitarizing after being constrained to a purely defensive force since World War II. Japan will now have the ability to take a more active role in response to a North Korean threat, further complicating the politics of East-Asia. As a result, Shinzo Abe has made preparation for evacuating all Japanese citizens residing in South Korea. When it comes to North Korea, both Japan and South Korea cannot afford to be patient, especially considering the instability of President Trump’s foreign policy. While North Korea’s apparent missile preparations continue to unfold, the U.S. continues to call for a vote on sanctions at the U.N. At the same time, the U.S. and South Korea continue military exercises to strengthen THAAD, waiting for China to act. However, more than sanctions and demonstrations will need to be proposed before a resolution is reached. A military response is not an option, meaning that sooner or later President Trump will likely be brought to the negotiating table. The world can only hope he is as good at making deals as he claims to be.